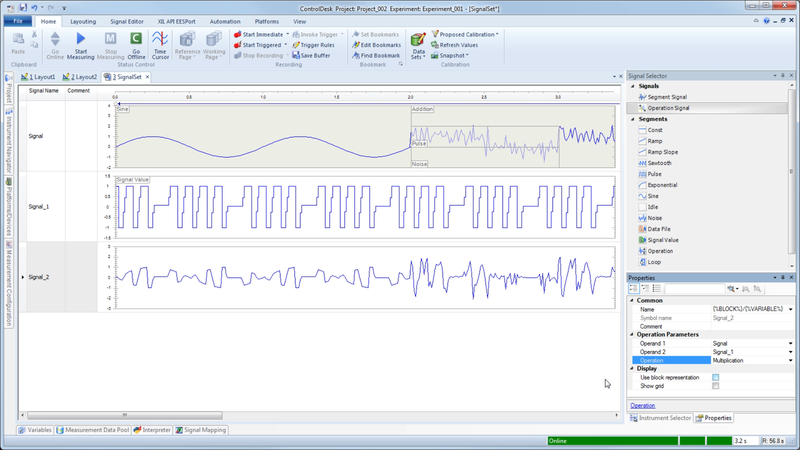 ControlDesk Version 6.4, the dSPACE experiment and visualization software, includes improvements in GPS data recording and support for Python and AUTOSAR. The interoperability of ASAM XIL API-compliant products, such as ControlDesk, is checked on a regular basis. 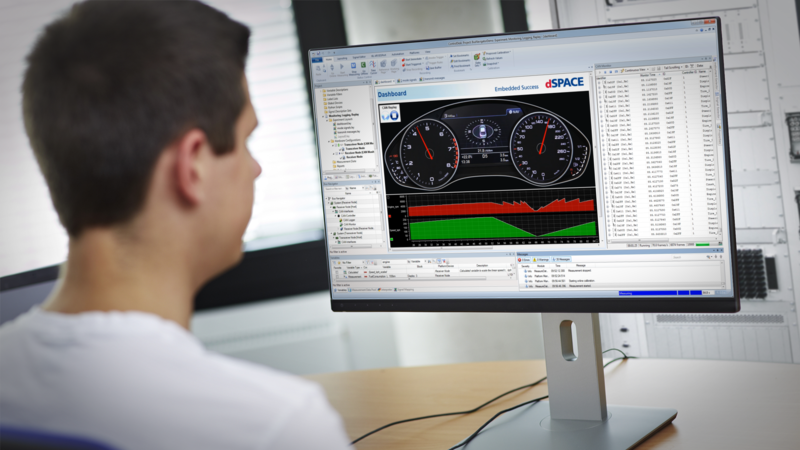 For this purpose, major vendors of development tools for automotive applications meet with dSPACE regularly to carry out so-called cross tests on their products. During these tests, they connect their test tools to third-party test benches to evaluate if their test software is able to communicate with test hardware from other manufacturers without issues. Continental’s new belt-driven starter generator uses not only the 48 V vehicle electrical system but also an asynchronous machine as the electric motor and generator – a novelty. dSPACE’s flexible HIL test systems spur the development of the mild hybrid ECU. Previous attempts at wedge clutches in automatic transmissions often failed because of unpleasant shift jerking. Researchers from Shanghai Jiao Tong University are working on solving this problem through a precisely controlled electric motor. The validation is based on hardware and software tools by dSPACE. For commercial vehicles, diversity is a standard. Scania has a nearly endless selection of vehicle types and modular vehicle configurations. And the generic electronic control unit (ECU) system has just as many variants. In a new test lab, Scania shows how this system can be validated with reliability. Definition of various error sets with the XIL API EESPort GUI in ControlDesk. Controlling and monitoring electric drives with ControlDesk. 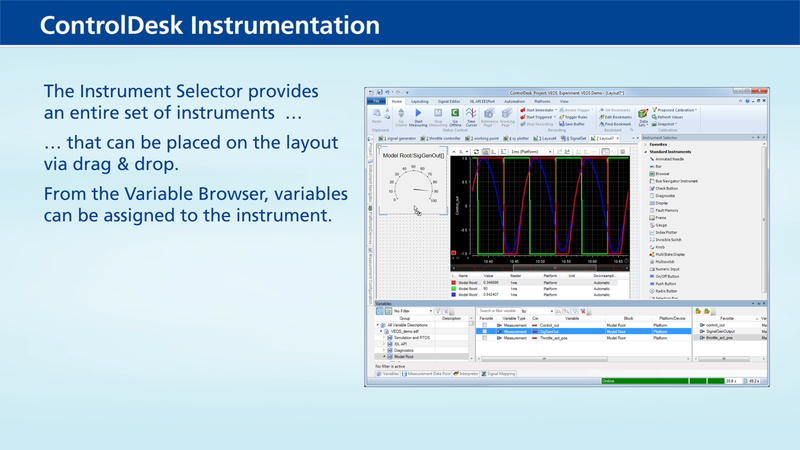 Learn more about ControlDesk, dSPACE's universal experiment software, an all-round tool for the development and validation process for electronic control units. Learn how ControlDesk enables you to create layouts easily and flexibly. Learn how to visualize, configure and trigger your data in ControlDesk. 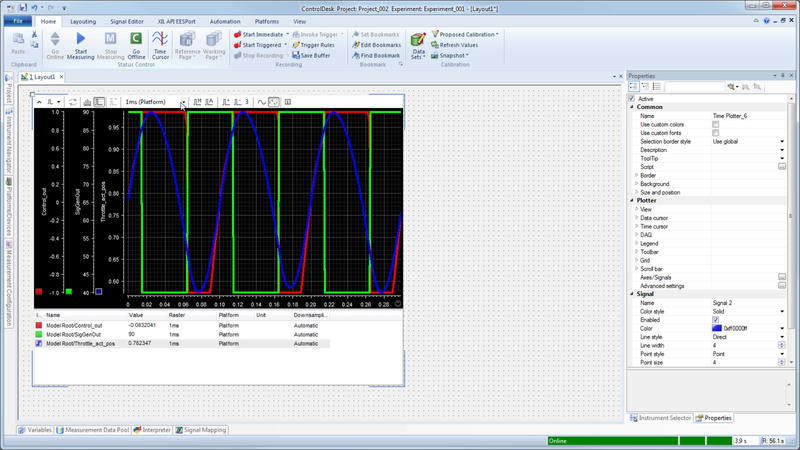 Learn how the Signal Editor lets you edit signal description sets to be used as signal generators for stimulating model variables. ControlDesk unites functionalities that often require several specialized tools. It provides access to simulation platforms as well as to connected bus systems and can perform measurement, calibration and diagnostics on ECUs, e.g., via standardized ASAM interfaces. Its flexible modular structure provides high scalability to meet the requirements of specific application cases. This gives you clear advantages in terms of handling, the amount of training needed, the required computing power, and costs. 1) MCD-3 automation functionality not supported. 2) Also for access to simulated virtual ECUs. 3) Signal generation not supported for the DS1104. 4) Monitoring, logging, and dedicated instruments for CAN and CAN FD are already supported with ControlDesk standard version.